Anambra Election: Biafra Group Withdraws Support For UPP. 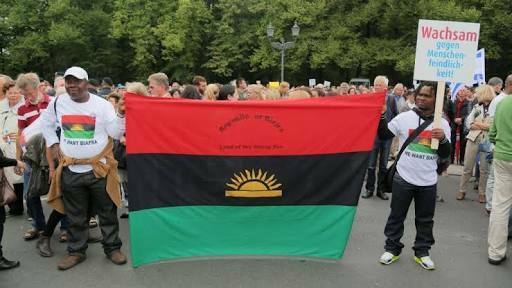 The Movement of Biafrans in Nigeria (MOBIN) Tuesday said it has withdrawn its support for the United Progressive Party (UPP) ahead of the forthcoming governorship elections in Anambra. Earlier, MOBIN had a mutual agreement with UPP to be the party’s mobilising agent on the premise that the party would pursue the ideologies of Biafra which it says is based on justice, equity and truth. But the organization said yesterday that it was pulling out of the arrangement, alleging that UPP failed in keeping its own part of the agreement. The statement released by the Director General of MOBIN, Rita Anigbogu stated that: “The Movement of Biafrans in Nigeria (MOBIN) wishes to inform the general public that it has withdrawn its support for the United Progressive Party (UPP). “Earlier this year, the UPP presented itself as the ideal political platform where Biafrans can get good governance in our struggle for freedom. On this premise, MOBIN had worked assiduously, believing that it was building a formidable haven in the interest of Biafrans. This was based on three cardinal principles which Biafrans at this juncture, cannot afford to sacrifice – Justice, Equity and Truth. “MOBIN believes that aside the fact that the very first political experiment involving Biafrans by the party was fraught with fraud and irregularities – the Anambra governorship primaries, the UPP has not demonstrated it’s an ideal party for the Biafran people. “In other Nigerian environments, the Anambra UPP primary would have been acceptable, but the contest was between two Biafrans and if any of them had won through that flawed process, MOBIN would still have rejected it. This is because the very corruption which had maligned Biafrans in Nigeria was introduced in the process, and as such, is unacceptable. Accepting it would have been a betrayal of the very principles and people MOBIN had set out to defend. “Before Biafrans joined the party, neither Biafrans nor UPP had any edge in Nigerian politics. Aggrieved PDP Senators return to chamber after Wednesday walk-out. Read More..
Stop Bad Mouthing Nigeria Everywhere You Go – Tinubu Tells Buhari.